Everyone knows that fire extinguishers are a “must have” item in homes and businesses. However, most people probably do not know that different extinguishers must be used under different circumstances. Having the wrong type of extinguisher can be worse than not having one at all. Proper use of a fire extinguisher can not only save your insureds’ property, it can save their lives. Minimum requirements for portable fire extinguishers are included in NFPA 10: Standard for Portable Fire Extinguishers. Local ordinances may be stricter. Fire extinguishers are labeled according to the type of fire they can fight – A, B, C, D, and K. Some extinguishers are considered multipurpose. The labels on these types will list more than one class of fire such as BC or ABC. The A and B ratings on the extinguisher include number ratings, based on Underwriters’ Laboratory (UL) tests, that approximate the relative size of each class of fire it can handle. Class A, B, and C fires can be handled with multipurpose dry chemical extinguishers. Class A fires are ordinary combustible material such as paper and cardboard. The extinguisher is generally filled with water pressurized with air. Water should never be used on fires involving grease, electricity, or Class D (combustible metal) materials, as it will actually cause the fire to spread, or lead to an electric shock. Class B fires involve flammable liquids such as gasoline, kerosene, or grease. Dry chemicals or foam are used to inhibit the fire by removing oxygen. Class C electrical fires must be battled with fire suppressants, such as carbon dioxide, that will not conduct electricity. This reduces the chance for electric shock. Once electricity is shut off, these become ordinary fires. Carbon dioxide extinguishers should not be used in confined spaces, as it will displace the oxygen needed to breathe. Class D fires involve combustible metals such as magnesium, potassium, and sodium. These can occur in laboratories, as well as some machine shops and machining operations. Class D extinguisher ratings are specific to the metal that is present, and can only be used for Class D fires. The specific chemicals for each type of Class D fire must be on hand prior to starting work on metals. Extinguishers should be kept away from potential fire sources and close to an exit. They also should be properly mounted, inspected monthly, and serviced annually. In residences, fire safety experts recommend a dry chemical extinguisher for the kitchen and another one for the garage. NFPA 10 requires that all commercial vehicles carry at least one fire extinguisher. In restaurant kitchens where the automatic extinguishing system is a wet chemical type, the portable extinguisher must also be wet chemical. A dry chemical extinguisher will blow the west chemical from the fire and all the fire to reignite. 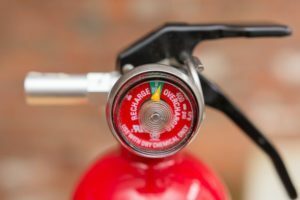 Many insurance policies include coverage to refill extinguishers that have been discharged to fight a fire. Disposable extinguishers must be discarded after use. Proper use of fire extinguishers can help to reduce fire damage. For insurance agents, putting in the extra effort to educate insureds on the ABC’s of fire extinguishers is the mark of a true insurance professional. This article is provided courtesy of MSO, Inc. (the mutual Service Office, Inc.). MSO provides custom rate, form, and statistical services for all property and casualty insurance lines except workers compensation. This includes customized forms and manuals for insurers, MGA”s and agents/brokers. MSO’s goal is to provide a simpler, more profitable way to underwrite risks. Additional information is available at www.msonet.com.